Denmark 1985-1986 Commemorative Selection: Group of 30 different NH VF 1985-1986 commemorative stamps plus two souvenir sheets, all complete sets, between Scott #769 and #831. All first quality. Some engraved by Slania. Individual retail over $62. Price discounted more than 40% as a group. To reduce mailing cost, mailed in small envelope, not on stock sheet. No charge for shipping within U.S. if order total over $40. Smaller orders and outside the U.S. there is an additional cost. Denmark Used Collection 1854-1976: Over 400 different used neatly mounted on Minkus pages. This includes a few better values (#12, 15, 19, etc. ), some useful medium values, and many commemoratives. Except for a couple of early issues with minor faults, condition is nearly all F-VF or better with later issues virtually all VF. Scott 2008 retail will exceed $650. You can fill many spaces very economically with this one! Denmark Substantial Collection in Stender Album 1852-1981: Collection of over 650 different Denmark plus a couple of dozen Danish West Indies and about 65 Greenland, 1852-1981. Mint and used (mostly used) in vintage hard cover Stender album. Many better items in the $10-$100+ range. Typical mixed condition: except varying degree of faults in the 19th Century; 20th Century is better, mostly F-VF or better with much VF. Overall 2012 catalog value will total well over $3000, plus another several hundred dollars not counted for various reasons. (Among the uncounted items you will find two Danish West Indies #18 bisects on piece!) This collection is ideal for someone who is not too fussy about condition and likes lots of higher values at a low percentage of catalog! Denmark Collection 1854-1964: Actually a collection balance, 1854-1964, about 230 different plus a few duplicates plus a few misc. Danish West Indies. Mint and Used (majority used) on Scott Specialty pages. Somewhat scattered contents, but does include some useful medium values. Condition varies as typical: there are some minor faults but large majority is generally F-VF or better. Scott 2012 retail will exceed $800 (plus a couple spacefillers including DWI #11 [$175] not counted). Our modest price takes the varying condition into account! Denmark Collection 1851-2006 in Scott Specialty Album: Sizable collection balance of over 900 different, 1851-2006, neatly displayed in black Showgard mounts, in excellent quality Scott Specialty 2-post album with slipcase. The majority of the stamps are used, but does include some later mint. Condition varies: 19th century is very mixed, ranging from sound to space fillers. 20th century quality is much better, nearly all at least F-VF with a large percentage VF. Scott 2016 retail value of the 19th century is over $950 (plus another $750 in faulty not counted); 20th century total exceeds $975, for a grand total of over $1925. In addition, the Scott album, binder, and slipcase, have a new retail cost of over $200! Here is your chance to fill a lot of spaces at a very attractive price! Denmark Collection Balance 1851-1993 in Vintage Stender Album: 1851-1993 Collection balance of about 550 different (plus color shades), mint or used, in old-style (hard-cover) Stender album. All periods represented with coverage ranging from sparse to moderate. The 19th century features a range of shades of the 4 RBS (Scott #2) and 4 SK (Scott #4, 7, 9) "square" stamps, plus some contrasting color shades of the Bi-Colors, etc. Has a good range of mint or used stamps from there to 1966. The 1967-1993 period is all mint (hinged) and includes some regular / definitive issue booklet panes. Condition varies from some minor faults to many sound, useful items. Some of the mint are lightly stuck, but can be safely lifted with care. Scott 2016 retail for the 19th century totals over $900 (plus some not counted) and the 20th century should total several hundred dollars more. The album pages are serviceable for their age; the binder is in excellent condition for this early style. With a little patience and effort, this collection will proved a surprising number of useful F-VF or better stamps! Denmark Large Collection Balance 1854-2003: Balance of a substantial collection: Well over 1000 different stamps, 1854-2003, mint and used (plus many both ways), neatly mounted on Minkus pages (the pages are not really reusable). Both 19th and 20th centuries well represented. Includes better values, many commemoratives including mint and used sets, many semi-postals and other back-of-book, and even a few Danish West Indies. The quality is rather nice with a minium of problems; the few quality problems are limited to the earliest issues. Nearly all F-VF or better, with much VF, and the mint includes some NH. Scott 2018 retail value will total well in excess of $2500! You should be able to fill in a great many spaces from this offering, at a great price! Denmark Collection Balance 1875-1976: About 350 different mint and used, 1875-1976, on usable Scott Specialty pages (some with black Hawid mounts). Includes Scott #164-75 used and quite a few mint commemoratives. There are a very few tiny condition problems but overall condition is overwhelmingly F-VF or better. Scott 2012 retail totals well over $600. Pages include DWI, but no DWI stamps. A clean collection which contains many useful stamps! 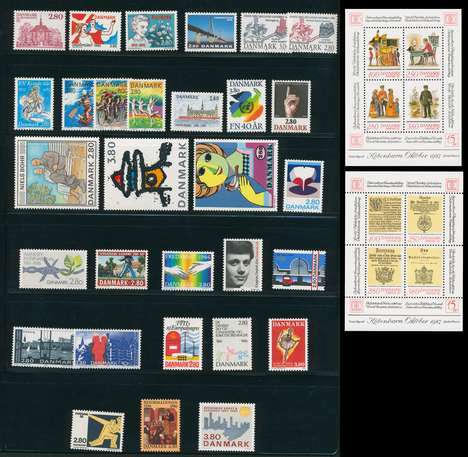 Denmark Booklet Collection 1977-2001: Collection of over 100 different complete Danish booklets from 1977 to 2001, neatly mounted on Scott Specialty style pages. Majority are commemoratives plus some definitives and slots, all NH VF. Jay Smith retail totals over $1425! Here is a unique opportunity to jump-start your Danish booklet collection at a significant savings over the cost if these were purchased individually!